Hewlett-Packard is also bringing Android to the PC, and has unveiled a 21.5-inch all-in-one desktop installed with Google's operating system. The device, called the HP Slate 21, was shown off at an HP event in Beijing on Monday. It's built with a high-definition IPS touch screen, and installed with Android 4.2.2, according to the company's official microblog in China. The Slate 21 has a starting price of $399 and will launch in the U.S. in September, HP said in a statement. The all-in-one uses the upcoming Tegra 4 quad-core processor from Nvidia, and is built with a high-definition webcam. In the back of the display is a stand that allows the device to be reclined into different viewing angles. In a company blog post, HP said it wanted to create an Android device that could be shared among users in a family home. “Creating a large-screened device with touch functionality, we thought we could unlock more uses,” said HP’s Eric Wiggins in the post. 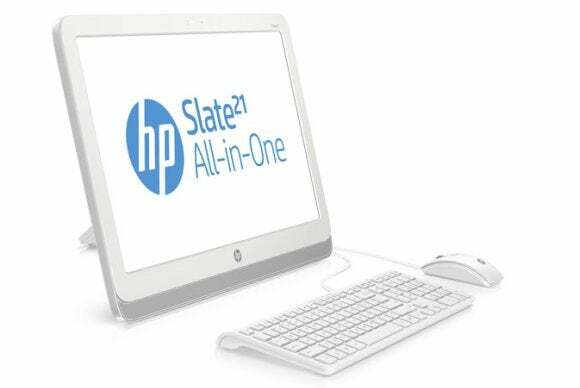 To optimize the Slate 21 for “desktop productivity,” HP is also including KingSoft’s office software on to the all-in-one. The desktop has 8GB of storage, but also comes with an SD card slot, and has three USB 2.0 ports. The $399 price point makes the Slate 21 the lowest-priced HP all-in-one, according to the company’s online store for the U.S. market. The next cheapest is a $449 all-in-one running Windows 8, using an AMD processor. Earlier this month Taiwanese PC maker Acer also showed off a 21.5-inch all-in-one installed with the OS at the Computex trade show in Taipei. Called the Acer N3-220, the desktop uses an 1.6GHz Nvidia Tegra 3 processor and will be available in September or October. Increasingly, PC makers are experimenting with Android, given that Microsoft's Windows 8 devices have struggled to attract consumers, according to analysts. Google promotes Android as a free and open operating system, and many tech companies are already relying on the OS to build their smartphone and tablet products. PC makers will come out with more Android devices, "But the question is what is it going to look like?" said Bryan Ma, an analyst with IDC. "Most of the good Android apps aren't really for the larger screens." Others are taking a more hybrid approach. Both Asus and Samsung have this month unveiled tablet-laptop convertibles that can run both Windows and Android. Updated at 9:35 a.m. PT with new information throughout the story.